Introduction: Ubiquitin regulates the protein turnover in a cell. Ubiquitin is a small, 76-residue protein (8.5 kDa) found both as free monomer and covalently attached to itself and other proteins in eukaryotic cells. The C-terminus of ubiquitin forms an isopeptide bond with the e-amino group of a lysine side chain in a target protein. In this way proteins can be covalently modified by the addition of ubiquitin which may alter the target protein\'s function. Monoubiquitination generally targets proteins for internalization, endocytosis and lysosomal degradation, or modifies the surface charge of histones and affects chromatin compaction. Ubiquitin+1 (Ub+1) is a novel mutant form of ubiquitin that can be produced through a process known as molecular frameshift. Ub+1 can be polyubiquitinated to produce aberrant polyubiquitin chains that inhibit the 26S proteasome. Especially ub+1 is accumulated in aggregates containing amyloid-beta and phosphorylated-tau. Elevated expression of Ub+1 mRNA and protein has been observed in the brains of patients with Alzheimer\'s disease. Also ub +1 acts as an aggravating factor in polyglutamine induced neurodegeneration. OriGene Technologies offers a wide range of antibodies for the detection of Ubiquitin. 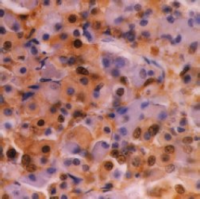 These antibodies are available in various formats and can be used in immunological methods like Western blotting, ELISA or immunohistochemistry. Fig. 1: Immunohistochemical staining of Ubiquitin in Formalin fixed, Paraffin processed tissue of Human hypophysis using antibody Cat.-No. SM1422P. Fig. 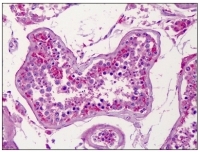 2: Immunohistochemical staining of Formalin-Fixed Paraffin-Embedded human testing tissue using plyclonal anti-Ubiquitin+1 antibody Cat.-No. AP23462PU-N. Fig. 3: Flow cytometry analysis of Ubiquitin in HeLa cells using monoclonal anti-Ubiquitin antibody Cat.-No. 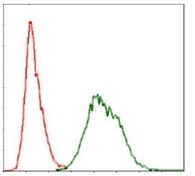 AM06722PU-N (green) and negative control (red). Fig. 4: Western blot analysis using monoclonal anti-Ubiquitin antibody Cat.-No. AM06722PU-N against NIH/3T3 (lane 1) and HeLa (lane 2) cell lysate. Fig. 5: Anti-Ubiquitin antibody Cat.-No. R1199 was tested by immunoblot against total cell extract from yeast. A 1:500 dilution of the antibody showed strong reactivity with Ubiquitinated proteins. The antibody was incubated overnight at 4°C in 5% non-fat dry milk in TTBS. Detection occurred using a 1:2000 dilution of HRP-labeled Donkey anti-Rabbit IgG for 1 hour at room temperature. A chemi-luminescence system was used for signal detection (Roche).